Preserving, Protecting and Propagating Endangered Medicinal Plants. 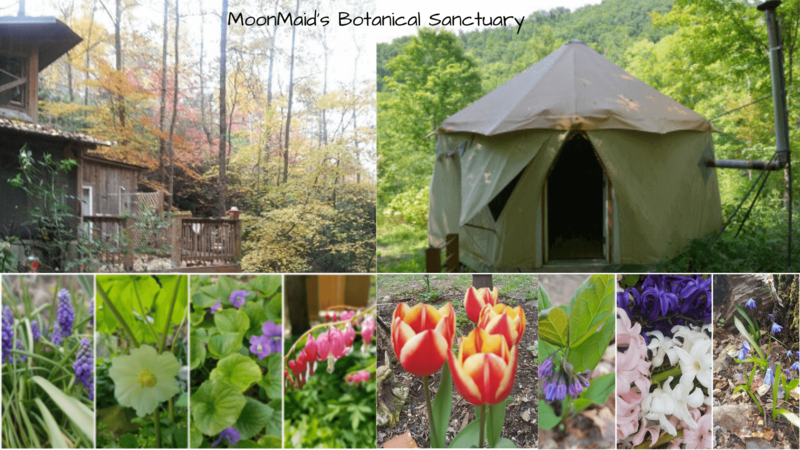 Nestled on 5 magical acres in the Great Smoky Mountains in East Tennessee, Medicine Woods is a woodland garden that supports abundant endangered medicinal plants including wild yam, goldenseal, black and blue cohosh, trillium, pink Lady Slippers, mayapple, and bloodroot. All are found in a native hardwood forest preserved in as natural habitat supporting medicinal plants, flowers, ferns, and fungi. Wild Yam is a major ingredient in MoonMaid Botanicals' product line and we are grateful to be a steward of this plant in this magical woodland setting. Though we do not harvest the yam that grows here, we do appreciate it's energetic presence. The Sanctuary goal is to encourage native plants to thrive in a natural setting. We “do” as little as possible. Of course, cleaning up fallen trees, raking trails and clearing the creek are all things that must be done regularly to preserve this serene setting. The organic garden always needs weeding. The propagated herb beds, with things that do not grow in the woods, needs constant attention as well. Come for a day or a week. Work exchange is always welcome. For further information on camping contact HipCamp (coming soon) for reservations. Camp in style in a 2 room REI Kingdom tent set on a platform near our organic gardens, our “medicine woods” garden and Frog Pond, a haven for frogs, goldfish, lotus and a small bass that found his way in.